POKHARA, Sept 23: Tourism entrepreneurs and locals of Annapurna Base Camp (ABC) have reached an agreement not to build additional motorways on the upper trekking trail for the next 30 years. 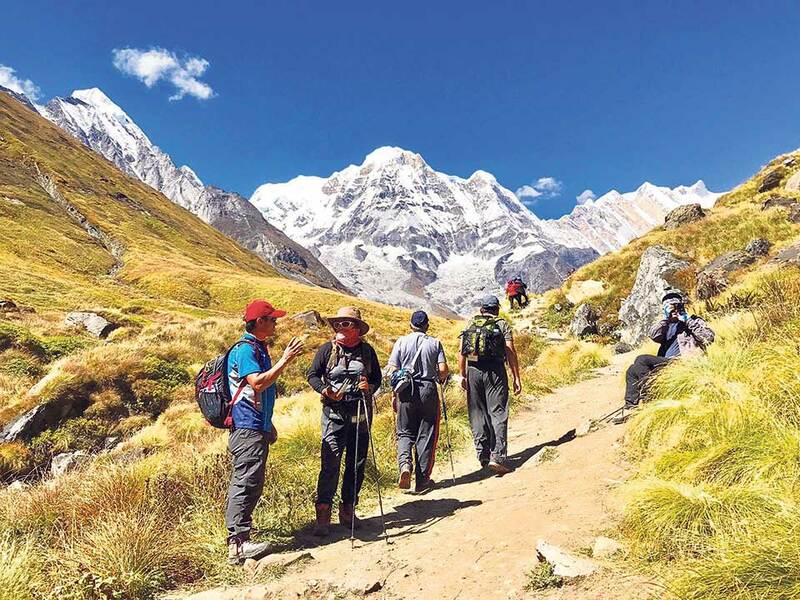 The move comes at a time when the average trekking duration of foreign tourists has been shortening due to the motorways built along the trekking trail in recent years. Locals have now decided not to construct roadways for the next 30 years beyond Jhinudanda village along the trail. The Annapurna Rural Municipality has also agreed to respect the decision taken at the local level. This move has been considered to preserve ABC foot trail at least for some years from now, according to entrepreneurs. “Trekking foot trail does not need motorway, that is why villagers themselves have taken an initiative to stop road expansion along the foot trail,” said Hari Bhujel, president of Trekking Agencies Association of Nepal (TAAN) for the western regional association. The ABC foot trail has been shrinking each passing year due to road expansion, which is causing losses to both the entrepreneurs and locals. Just a few years back tourists used to walk up to Ghandruk from Naya Pul, but now motorway links up to Ghandruk. “Tourists used to stay overnight or have food on their way during the ABC trek, but now as they can reach up to Ghandruk on vehicles small shops along the foot trail have been displaced,” Bhujel told Republica. Road expansion could destroy the local business, he added. On an average, it takes at least three days to reach ABC from Jhinudanda. Beyond Jhinudanda, there are no residential settlements except lodges and restaurants aimed to serve trekkers. These businesses are also operating under the Annapurna Conservation Area Project. It used to take 10 days to reach ABC is the past years. But now, the length has been shortened by half due to the construction of the motorway. Tourism is often regarded as the backbone of the country’s economy. Most of the tourists visiting Nepal come for trekking and other adventurous activities. The numbers of both foreign and domestic trekkers are increasing each year, but the excitement of walking to ABC is continuously decreasing each passing year, which the locals blame at the road extension along the foot trail.